How Should NPR Report On Hacked WikiLeaks Emails? : NPR Public Editor Ethical dilemmas make reporting on hacked information awkward. 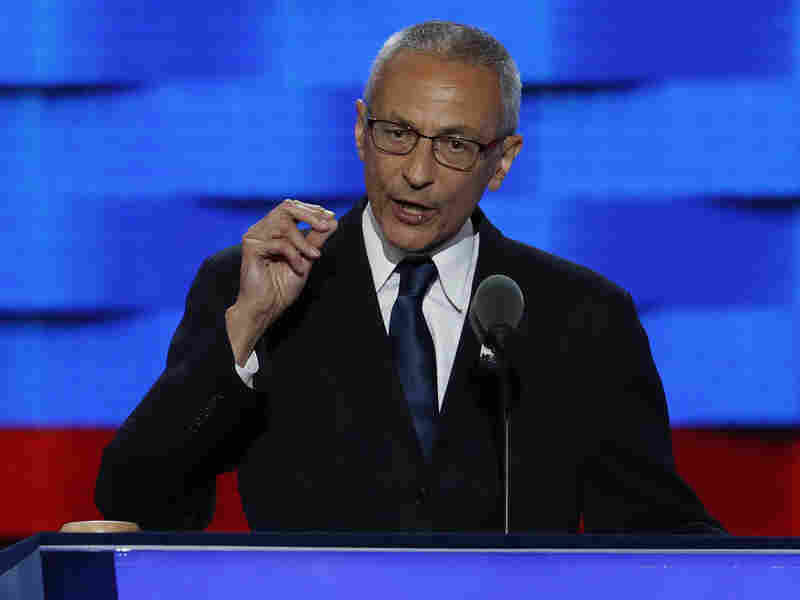 WikiLeaks released emails allegedly from Democratic presidential candidate Hillary Clinton's campaign chairman, John Podesta. My office has spent many recent hours responding to readers and listeners who believe NPR has not covered, or covered enough, the ongoing release of hacked emails allegedly taken from Democratic presidential candidate Hillary Clinton's campaign chairman, John Podesta. In fact, NPR has covered the content of the emails fairly extensively (and that coverage has brought its own complaints from listeners and readers who believe the email revelations are relatively unimportant compared to other issues bubbling up in the presidential race, or policy discussions). My question for this column is a little different: Are there ethical reasons for NPR to have avoided covering them? As an online NPR story noted, "WikiLeaks on Saturday released another tranche of emails allegedly linked to Hillary Clinton campaign chairman John Podesta, bringing the total to more than 11,000 emails released over the last eight days." As it painstakingly combs through them, NPR has published or aired 11 stories that touched on their content this month (five online-only and six on-air, either during the morning or evening newsmagazines or the midday Here and Now). WikiLeaks has not identified the source of the emails, nor did it say where it got a trove of alleged emails from the Democratic National Committee that it released earlier this summer. U.S. officials have blamed Russia for hacking those earlier emails in an attempt to meddle in the U.S. election. As NPR itself reported: "The Clinton campaign has not confirmed that the hacked emails are real and NPR has not been able to confirm their authenticity, but the campaign has linked the hack to Russia and says Moscow is interfering with the election to promote Donald Trump's candidacy." NPR has also reported on concerns that the emails could have been doctored. Another report put it even more succinctly: "The Clinton campaign is refusing to verify the authenticity of any of the documents, which it describes as stolen." One would presume that if the emails were patently false, the Clinton camp would have said so, and in one case, a subject of the emails, Democratic National Committee interim chair Donna Brazile, has denied that one incident described by the emails took place. But journalism is not supposed to be based on presumptions, and refusing to confirm that the emails are real is not the same thing as denying their authenticity. On the other hand, by leaving journalists in limbo, the Clinton camp may also be seeking to instill some caution in how they proceed. Essentially, then, the debate boils down to whether transparency — the disclosure by NPR that it cannot confirm the authenticity of the emails, and that some have raised questions about whether the emails have been faked — is enough to tip the balance in favor of reporting about them, instead of taking a far more cautious approach or even deciding not to report on them altogether. Marcia Erickson of Longmont, Colo., wrote that quoting WikiLeaks releases without verifying authenticity is "problematic" because "You are just reporting what's being released by WikiLeaks hackers and it could very well be salted with faked content." Amy Conners, of Minneapolis, Minn., wrote: "What are the ethical implications in reporting on stolen information without reporting where it came from and why it was leaked?" David Diggs, of Victorville, Calif., wrote: "Should WikiLeaks pilfering be legitimize[d] (offered a venue) by NPR? I have real problems with the casualness of reporting information that was the result of theft." He added, "If a story, regardless of how it was obtained, was of genuine public interest ... that most likely would pass muster (e.g., people have the right to know if their elected officials are crooks)," but he wrote that he did not feel the stories that were published rose to that level. The significance of the news attributed to the emails has ranged widely. The Washington Post editorial board seemed to dismiss their value, writing, "We hope the excerpts are genuine, because at least in the texts made public as of Monday, the Hillary Clinton that emerges is a knowledgeable, balanced political veteran with sound policy instincts and a mature sense of how to sustain a decent, stable democracy." But a listener who wrote to my office said the she and her family were "deeply offended" by the alleged emails in which Podesta discusses Catholicism. The New York Times unearthed in the alleged emails an insightful look at what it called the "complex ethical issues the Clinton Foundation faced in managing relationships with foreign governments when Hillary Clinton was secretary of state." NPR's Tamara Keith, among others, reported on what had been a hot topic during Clinton's primary battle against Sen. Bernie Sanders, the content of private speeches Clinton gave to the investment banking firm Goldman Sachs. She also turned up a story that was more inside-baseball but no less interesting: alleged evidence of some of the thinking inside Clinton's campaign as it crafted its response to her controversial private email system. Of that particular NPR story, a listener in Colorado objected: "...one would be hard pressed to find any caveat about possible editing that may have occurred," adding, "a lengthy article with long quotations from the emails as leaked would imply that NPR has verified what they seem to be reporting as fact. Please be clear as to what has and has not been properly verified as factual." These are thorny issues, to my mind. Weekend All Things Considered host Michel Martin explored some of the implications with NPR media correspondent David Folkenflik last month. NPR's newsroom also takes such issues seriously, in my experience, so it's no surprise that Mark Memmott, NPR's standards and practices editor, told me there were internal conversations about publishing stories based on the emails, from their news value to "the ethics of reporting about them." He argues that, "These are public officials and sometimes you get a peek behind the scenes." Not only are the stories in the public interest, he said, but "I think we've tried to be responsible" by reporting clearly what the campaign has or has not acknowledged. Newsroom deliberations about how to treat hacked information are getting to be somewhat routine, so much so that Nieman Reports took a deep dive into the ethics of publishing stolen data last year. As Nieman notes, WikiLeaks began dumping confidential material a decade ago; Edward Snowden's disclosures about U.S. intelligence surveillance came in 2013; and Sony Corp. was subjected to an embarrassing exposure of its internal workings when hackers put online some of that company's internal information in 2014. And of course NPR and other news organizations routinely report on leaked information (although not necessarily stolen) from confidential sources, including Trump's 1995 tax returns a couple weeks ago, using the argument that the reports are in the public interest. In the case of the most recent emails, there doesn't seem to be any theft of intellectual property, as was the case in the Sony leaks. The contents of the emails came up in the latest presidential candidate debate, and the stories NPR has published so far are arguably indeed in the public interest (although one could make the case for either side regarding the email that dealt with how best to cook risotto). On the other hand, Sen. Marco Rubio, R-Fla., who is up for re-election, said he will "not discuss any issue that has become public solely on the basis of WikiLeaks," because, "As our intelligence agencies have said, these leaks are an effort by a foreign government to interfere with our electoral process, and I will not indulge in it." I do wonder whether — if a presidential election weren't at issue — some newsrooms might have been more reticent to publish these emails given their murky provenance. Yet what is more important than a presidential election? That only makes it all the more crucial to get it right. My conclusion: I don't see how NPR can ignore the emails altogether, but it needs to tread very cautiously. I believe most of NPR's disclaimers so far have been very clear and admirable. Memmott called the situation "awkward," which may not be satisfying to some listeners and readers, but it is an accurate reflection, in my opinion, of the dilemma that journalists are facing in this case.